I mentioned earlier this week that I had some pain in my right calf. It mainly felt tight and after a warm up would go away for the most part. Until Monday. I was out doing some intervals, and my calf never fully warmed up. And then it just started hurting so bad while I was running that I had to limp back to my car without completing my run. So, of course, I googled. What could the issue be? I ruled out Achilles tendinitis. And I didn’t think it was a strain of the the larger calf muscle, the gastrocnemius. It was further down on my leg, a few inches above my ankle. 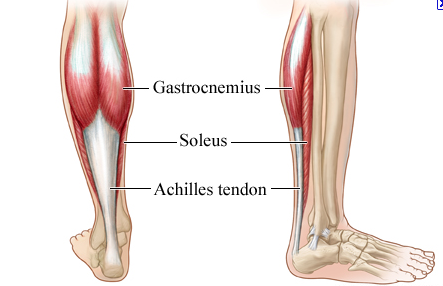 What seemed to fit was the strain of a muscle I had never even heard of before, the soleus. Let me take a minute here to say that I am not a doctor. I don’t know for sure if what I have is a soleus strain. It just seems to make sense to me. Take this handy PDF that explains the differences between strains of the two main calf muscles: “Soleus strains…often present as a tightening over days or weeks. They can also feel like soreness that gets worse whilst running and eventually causes the athlete to stop running, either during that run or subsequent runs.” That sounds exactly like my problem. Basically, whenever my knee is bent and weight is transferred to that leg is when it hurts. I confirmed this by trying some single leg bent knee calf raises. They are no problem on my left leg but on my right leg make me wince. Navigating stairs hurt, especially going down stairs. The solution is the typical RICE advice: rest, ice, compression, and elevation. I’m taking a week off from running, icing my leg (most) every day, and elevating as much as I can. It’s also completely wrapped up in athletic tape right now. Also, ibuprofen is nice, but I don’t want it to fool me into thinking my leg is better when it actually isn’t, so I take it sparingly. So my next weekly report will be pretty sparse, and I guess I need to include these calf raises in my normal daily stretches from now on. I’ve really been trying to get better at pacing. (How many times have you seen me mention that I was going too fast and wore myself out too quickly?) There’s lots of online pacing calculators out there, but I really like the McMillan Running Calculator because not only does it tell you what your pace should be on race day, but also what pace your training runs should be at. 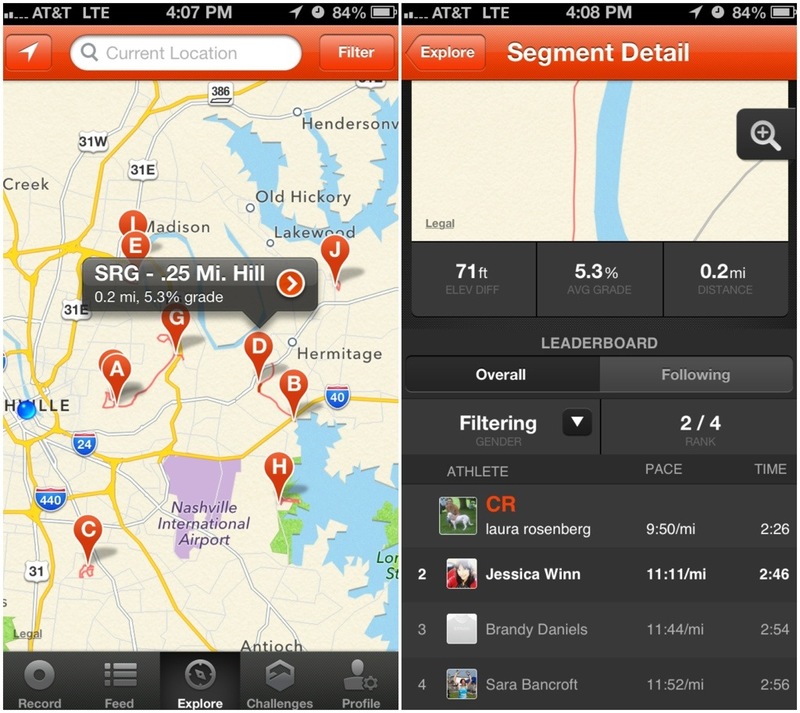 You plug in recent race data. I’m plugging in a 35 minute 5k, even though I can run it faster than that. 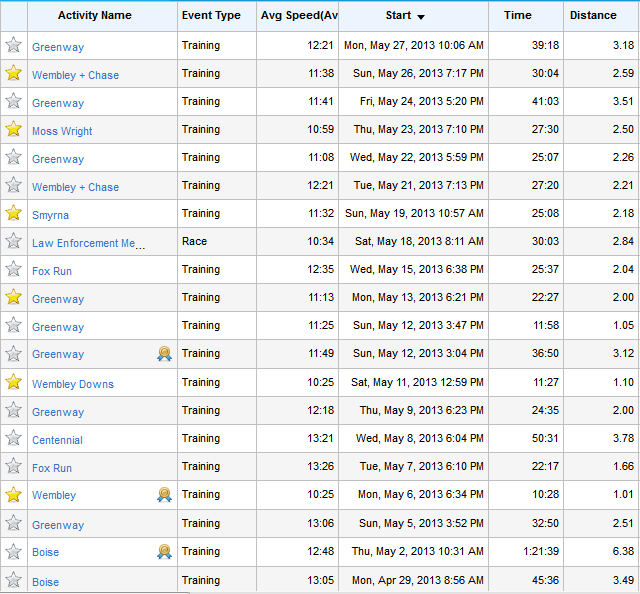 But I know I can do 35 minutes pretty consistently now and the one mile pace it lists is very close to my one mile PR. As you can see, if I keep training at this same level, I should be able to run about 1:13 at my 10k in July and 2:42 at my half marathon in January. You can also enter a goal race pace to see what you should aim for, but for now, I just want to mainly focus on endurance over speed. The training paces is where it gets really interesting. 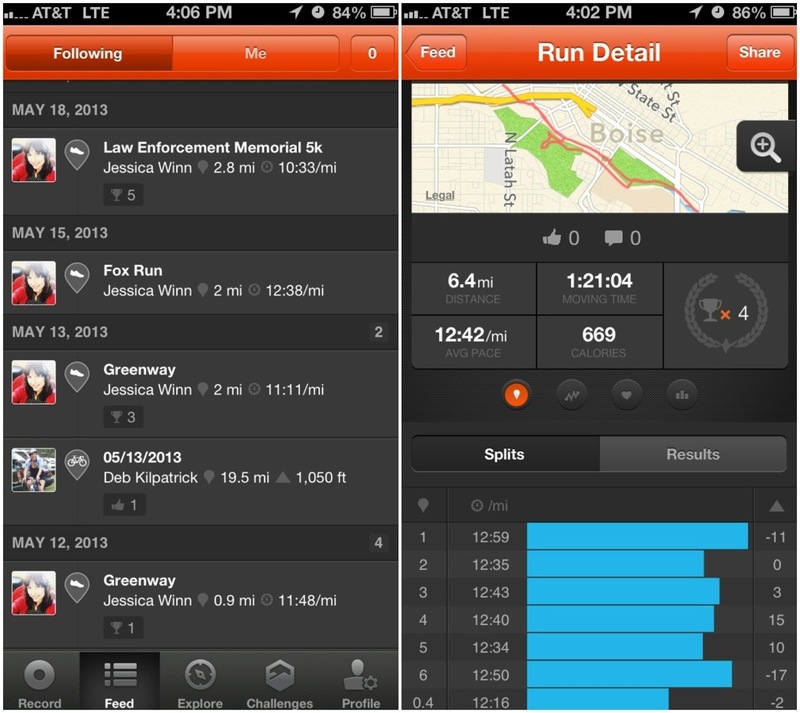 There are several different types of training runs you can do. 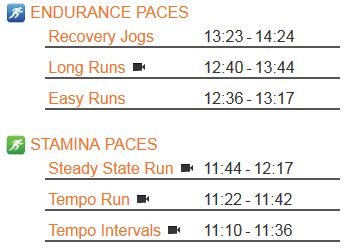 The majority of all runs should be easy runs, which are done around 1-2 min/mile slower than race pace. Long runs should be done once a week or once every other week and they are mainly to build endurance and should be ran fairly slow. In my case, around a 13 min/mile. Recovery runs are done after hard workouts to help you recover (wonder where they got the name…) and are the slowest of all your runs. In my case, this is called walking, as I find it impossible to run that slow. Tempo runs are meant to increase speed over time, and these are what the majority of runs tend to fall into, which leaves my heart rate soaring and me horribly out of breath at the end. 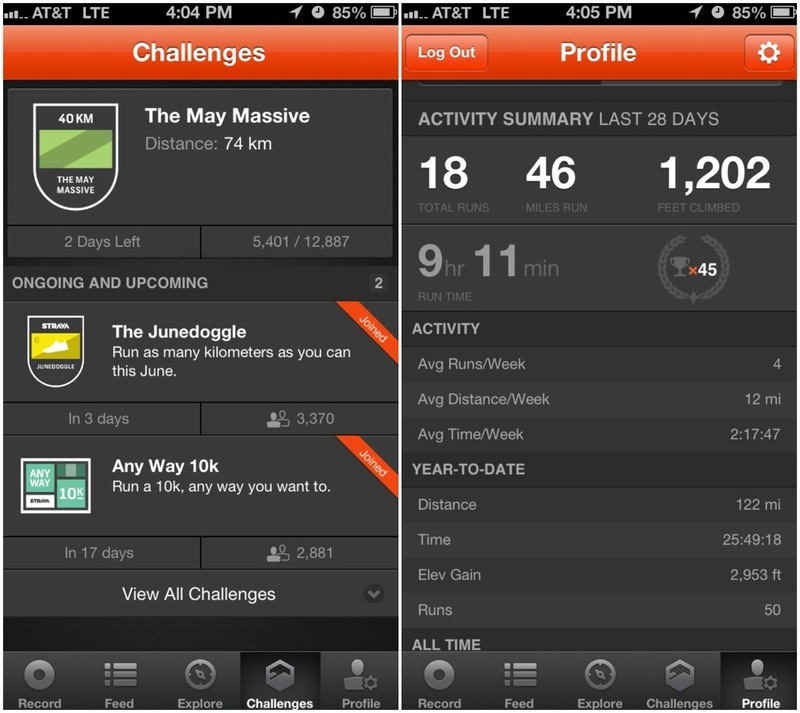 Most of these are not just straight runs, but run/walk intervals. I starred all the ones that had no walk breaks at all. And you can see that none of them fall into the “endurance pace” I should be running; they are all at least 1 min/mile faster. Even the ones with walk breaks don’t fall into that pace category, which means my running sections were probably way too fast (and no wonder I needed the walk breaks!). 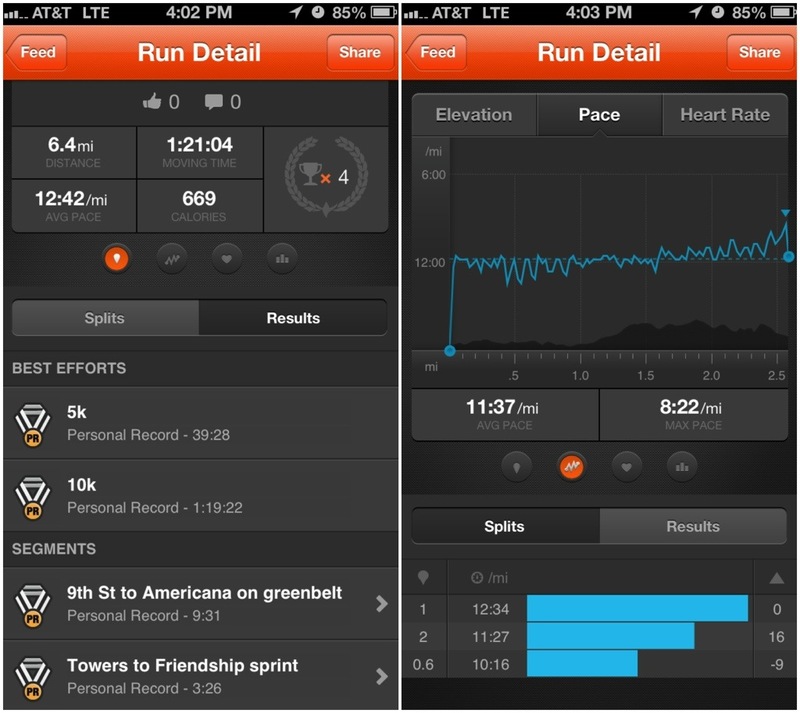 I really try to slow myself down, especially as I start training for longer distances and doing regular long runs. I just find it so hard because it feels like I’m crawling and like it almost takes more energy to go that slow. Does anyone have any tips? 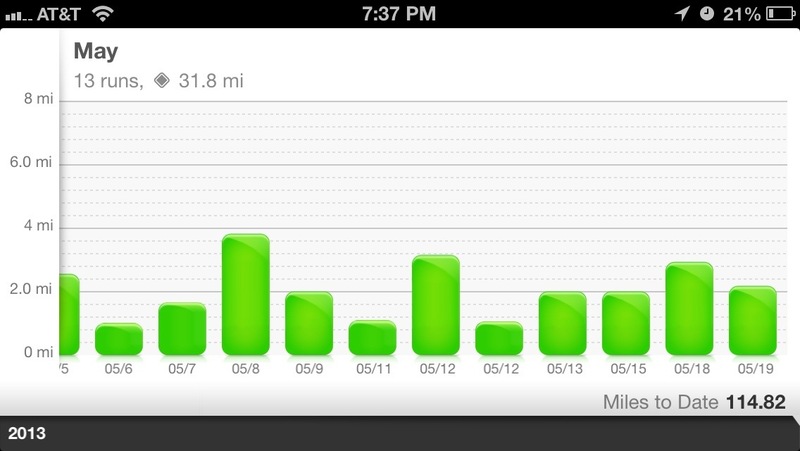 Note: I have no idea why Nike+ isn’t showing the pretty green bar for Sunday’s run. It appears as though the totals are correct, though. I took a rest day on Monday to go check out the new Music City Center. Although it turned out to not be a lot of “rest” because I chose to wear heels and after all that walking, I was pretty sore AND had a blister on my right pinkie toe. Which is why on Tuesday it was the first day in recent memory that I’ve actually had to force myself to go run. Normally I look forward to it. 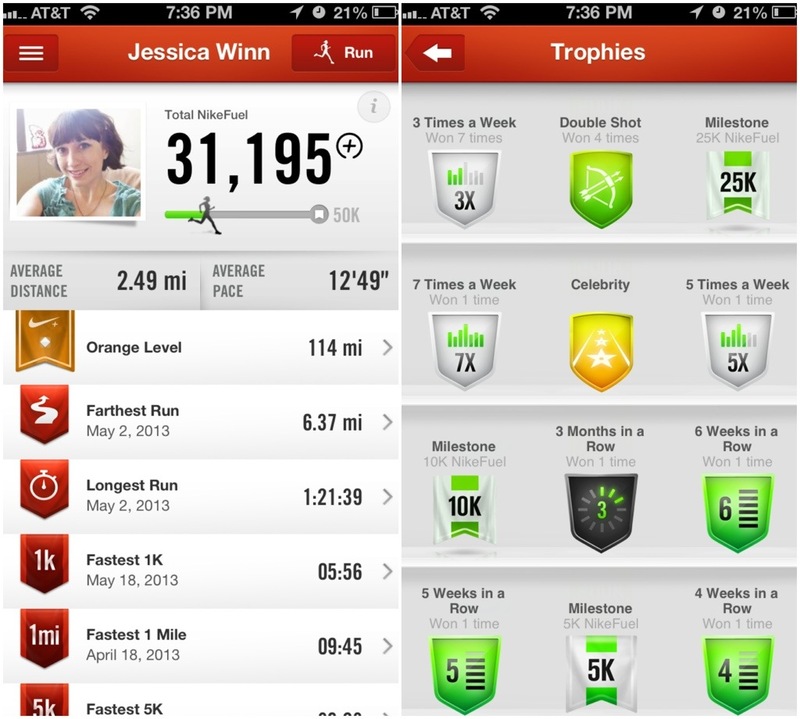 But I grumbled to myself as I put on my running clothes and headed out the door. Then grumbled through the first half mile. And the entirety of the first mile. Then I got a side cramp because I forgot my water bottle (despite having actually hydrated well all day). I massaged it out as best I could and then for the last half mile, I actually felt good (although sore). 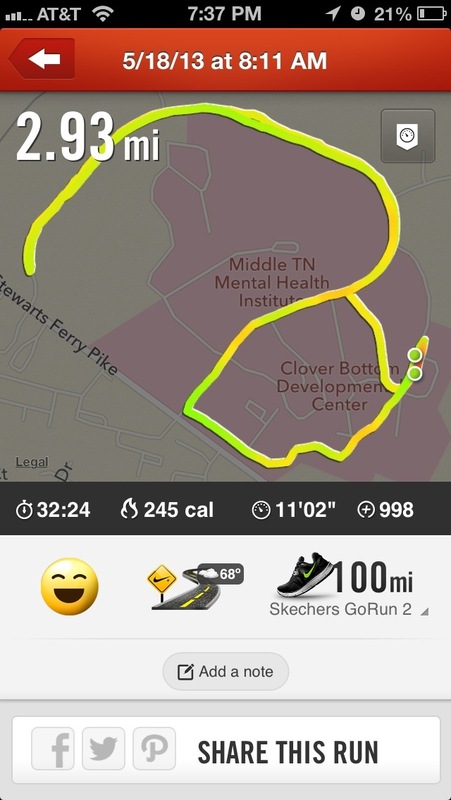 On Wednesday, I was still a little sore, but I went out to the greenway to try to do the next day of Couch to 10k. I am still not used to the humidity. I know that when it’s humid, you are supposed to slow down. 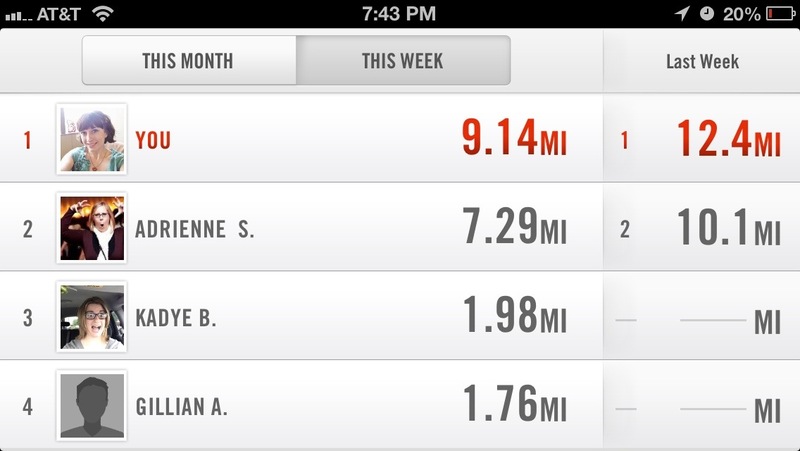 Yet I am horrible at being able to slow down once I’ve started on a pace. In fact, I found myself running FASTER than normal (because if I can’t run a 9 minute mile in perfect conditions, why would I be able to when I can’t adequately cool myself down?). You can understand then how I wore myself out before the end of the 25 minutes I was supposed to run and ended up taking quite a few walk breaks. Supposedly it takes two weeks to acclimate to the heat and humidity. We will see. With this in mind, I waited a little later to go out on Thursday (around 7pm). I was able to get in a good ten minute warm up. I almost started developing a side stitch during my warmup, which made me kind of nervous. It went away when I started the run and came back around 1.5 miles, but it wasn’t the horrible, debilitating stitch I usually get, so I was able to run through it. I believe the cooler weather plus the fact that I was running in a new location helped me to not only finish the 25 minutes without walking, but I went actually beyond to 27:30! 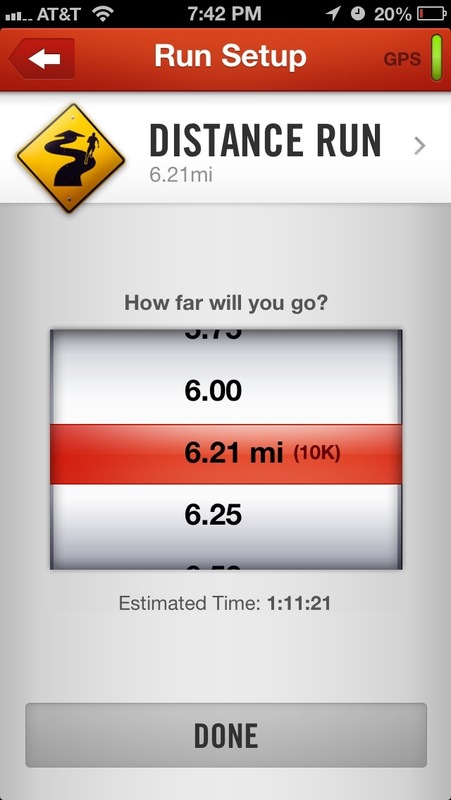 I almost pushed myself to do a whole 5k without walking (I think I could have done it…what’s another 6 minutes or so? 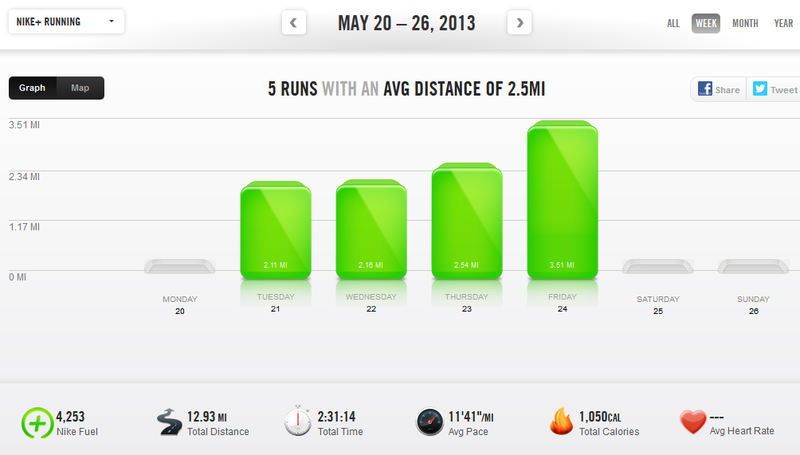 ), but I wanted to do a long run the next day so didn’t want to push too hard. Still, I got my second best time on 2 miles (the best being at the race last Saturday) at 22:01, and I was being pretty consistent with my pacing (although a few times I caught myself trying to go too fast and had to slow down). Of course, despite my experimentation with going out later, I didn’t learn. On Friday I headed out right after work, and it was hot. I was planning on putting in around four miles by attempting to slightly jump ahead on Couch to 10k to the first day of week 9, just to see how I’d do. This involves four repetitions of running for ten minutes and walking for one. I made it through the first two repetitions without issues, but by the start of the third, I was on a stretch of the greenway out in the hot sun. And I was out of water. And sore. So I walked way more than I should through the third repetition and didn’t even finish the fourth, choosing to stop after I’d achieved 3.5 miles. My right calf was super sore, so I decided to go home and ice it and take Saturday off for a rest day. I thought the rest did me well until I started my run on Sunday. My warm up was horrible, just as it’s been for the past few runs. I started getting a side stitch and my right calf was sore again. But after I finished warming up, it went amazing. I was supposed to run 25 minutes without walking, and I ended up doing 30! I paced really well too, coming about a minute per mile down on each split (~12:30 on my first mile, 11:30 on my second, and 10:30 on the last 0.6). Go me!